Whether this costume is for a historical reenactment, a play, or just for fun, you're sure to get in character as soon as you slip it on. The jacket is layered over a full vest and is accented with a cravat tie. The long coat will make you feel official as you make your entrance into both European and American courts. The short pants have an elastic waist, letting your outfit stay tucked in and you remain comfortable. 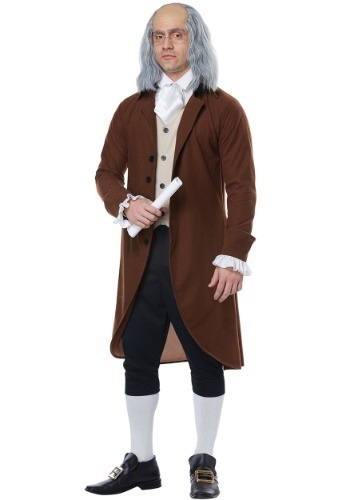 You'll go down in costume party lore when you show up to any Halloween bash dressed as the gregarious Benjamin Franklin. All you need to do is top off this look with our hilarious receding hairline Benjamin Franklin wig and you'll be ready to spread the word of our new nation. Hey, play your cards right and you might even come up with a few inventions as the evening goes by. Never hurts to step into the shoes of a genius!